"As soon as you are willing to discard observational data because it conflicts with religion, you are giving up hope of ever really understanding the universe." Both the continuing exploration of space and the popularity of science fiction makes this question irresistible, and perhaps inevitable. I am the good shepherd; I know my sheep and my sheep know me— just as the Father knows me and I know the Father—and I lay down my life for the sheep. Wouldn't the discovery of life on other planets totally destroy the Bible? "Sometimes I think we're alone. Sometimes I think we're not. In either case, the thought is staggering." There is speculation about the possible existence in the universe of other life sustaining planets like the earth. 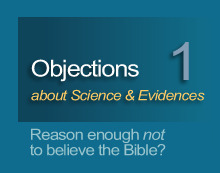 Would evidence of their existence or of life on them refute the Bible? Whether or not this planet is the only life-bearing one is not dealt with in the Bible (no particular interpretation of the creation account necessarily favors or forbids this possibility). Conceivably, as God nurtured the small nation of Israel for the role of evangelizing the entire world, our world could be destined for a similar role on a much grander scale. At present, I would say this is not likely. As for traces of life on other planets, like Mars, it is conceivable that some building-block type chemicals may be found, but chemicals and associated chemical compounds do not constitute life. For greater discussion, read what the discoverer of DNA and others have to say about the matter; also here.